Brigit's Scraps "Where Scraps Become Treasures": My Creative Time 45th Release Blog Hop! Stunning tag, Brigit! I love how you colored your flowers, and that background paper is awesome! I am IN LOVE with the Mason Jar!!! WOW! Just GORGEOUS Miss Brigit! THANK YOU for your AMAZING sneaky peeks this week as well! OMG Miss Brigit your tag is Gorgeous!! WOW your water coloring is so beautiful...you so did an outstanding creative job!! YOU so ROCK!! What a sweet tag! Great coloring! Your tag is so pretty! Love all the soft colors and layering. Love your tag it's beautiful---Thanks for a great week. 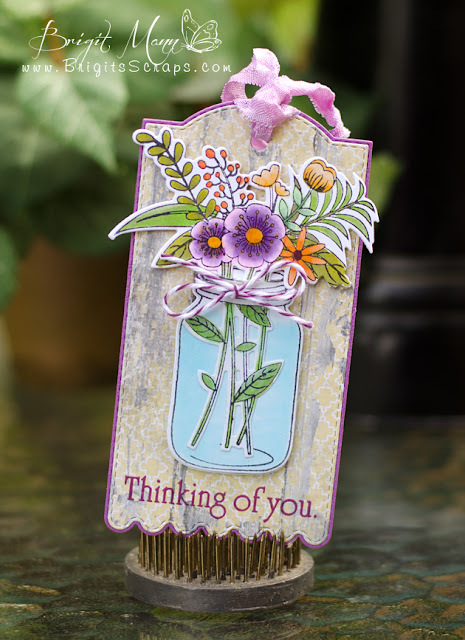 Beautiful tag...love the colors and the distressed background. I really like this set too. Beautiful job. Your tag is so lovely! This release is awesome, as always. Your tag is gorgeous and your coloring is beautiful. Such a lovely tag. The flowers are gorgeous! Love the fishing stamps and dies. Beautiful tag. Love the colors. Thanks for sharing. Love your project - so pretty! Brigit ~ simply STUNNING! The colors, the coloring and oh my the papers ~ just BEAUTIFUL! AMAZING job al week! Your tag is super beautiful! Love the purple and lavender with the yellow flowers. You did an outstanding job. Supper cute, great job, love all the colors. I love the basic color and the flowers are colored so great. Love the colors on the card it's just beautiful! Your tag is beautiful. Love your colouring and the 3-D effect you gave your image with the bow tied around the top of the jar. Your card is gorgeous Brigit!!! I love the colors that you choose for your tag, is so beautiful!!! Wow Brigit! Those flowers are just beautiful!!! Love it! Your tag is so pretty! I'm looking at it again. Beautiful tag! The coloring is fantastic! Love your projects. The release is so cute. What a gorgeous tag Brigit!! Brigit, this is one lovely tag. Your coloring and photography are perfection, always. Simply beautiful tag! You did a fabulous job coloring and coordinating everything! I think the tag is so beautiful! What a beautiful Tag,Brigit!! WOW! The colors are amazing!!! Your tag is beautiful. Love your wonderful coloring. Thanks for sharing. What an adorable tag Brigit! Love it! TFS! I've been looking for a special jar set! This is gorgeous! I really like what you did with it. Thank you for the inspiration!